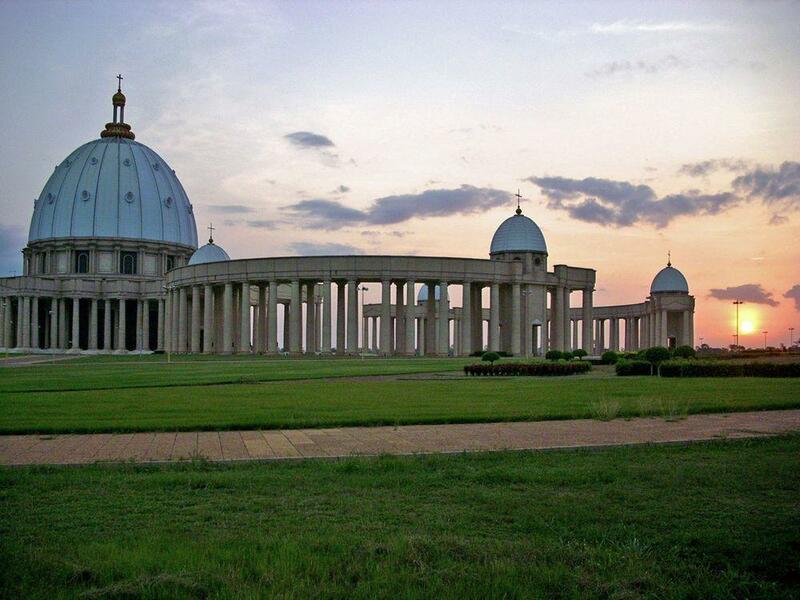 The largest basilica in the world – Yamoussoukro Basilica of Our Lady of Peace – was financed by the president of Côte d’Ivoire Félix Houphouët-Boigny. It was built in his birthplace – current capital of the country. The first president of Côte d’Ivoire – Félix Houphouët-Boigny (1905 – 1993) – was a legendary person. He was a doctor, tribal chief, member of French Parliament, minister in French government and finally – for 33 years until his death he was the president of Côte d’Ivoire. In many respects he was successful statesman who led his country to comparative prosperity. Houphouët-Boigny though did not forget about himself – he was one of the richest men in Africa. The first president of Côte d’Ivoire wanted to build a new capital near the centre of country – in his birthplace Yamoussoukro. As the main building there was planned the largest church in the world – a hefty counterweight to the Islam and local religions, which are also popular in this country. The giant basilica was built in the time period between 1985 and 1989, its cost was 150 – 200 million USD (according to other sources: 300 million USD). Lebanese architect Pierre Fakhoury was selected to implement this highly controversial project which contrasted with the general powerty of Western Africa. Vatican was not too happy with these plans either: in "the middle of nowhere" was rising larger church than the previous world’s largest church – St. Peter’s Basilica in Vatican. Architect Fakhoury had to find a compromise between the wishes of Houphouët-Boigny and Vatican. Thus the dome of basilica in Yamoussoukro was a bit lower than the one of St. Peter’s Basilica, but the cross on the top – larger. Basilica was presented to Pope John Paul II as a personal gift by Houphouët-Boigny. Pope did not accept this gift but nevertheless consecrated it on September 10 1990 in the presence of 300,000 worshippers. Pope agreed to come here against a promise that modern hospital would be built in Yamoussoukro. This promise has not been fulfilled – hospital is under construction up to this day. Basilica is devoted to Our Lady of Peace – a symbol of peace, impersonation of the Blessed Virgin Mary which holds a dove and an olive branch. 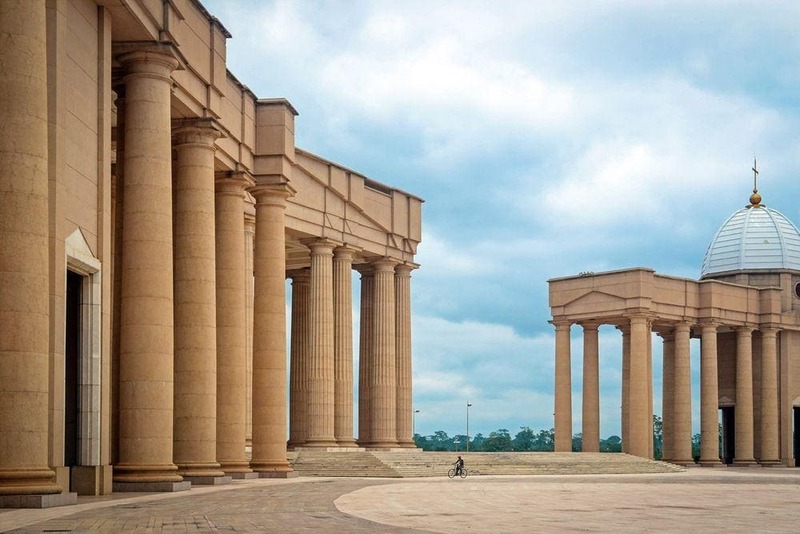 The architecture of Yamoussoukro Basilica has little in common with its environs, it follows the rules of European architecture. 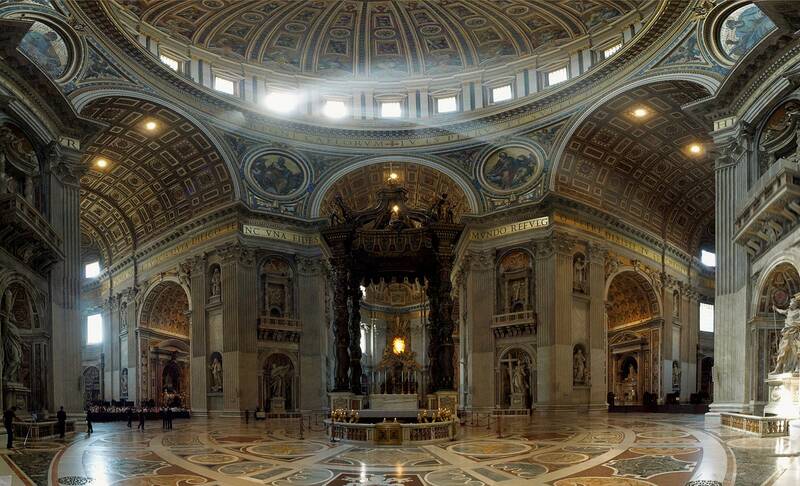 In many ways it is similar to the Basilica of St. Peter in the Vatican City but nevertheless there are many differences. The main building in the complex of buildings is basilica itself. It has two arms with 128 Doric columns which enclose enormous plaza in the front of building. Next to the church are two smaller buildings: rectory and villa. 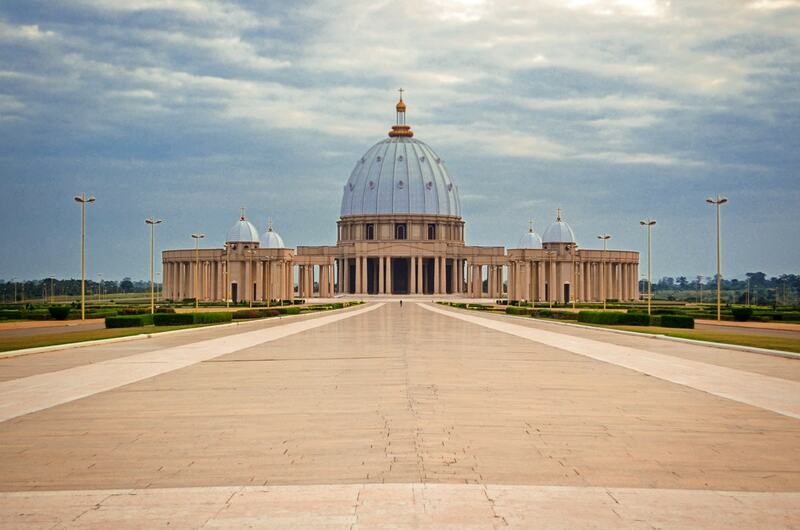 Villa was envisaged for pope: it seems that Houphouët-Boigny had expectations that popes may become frequent visitors to Yamoussoukro. Area of building (including the rectory and villa) is 30,000 m³, height of dome – 149 m, height of cross (total height) – 158 m. Dome itself is 60 m tall and has a diameter of 90 m. Basilica can accomodate 18,000 worshippers – much less than 60,000 in St. Peter’s Basilica. 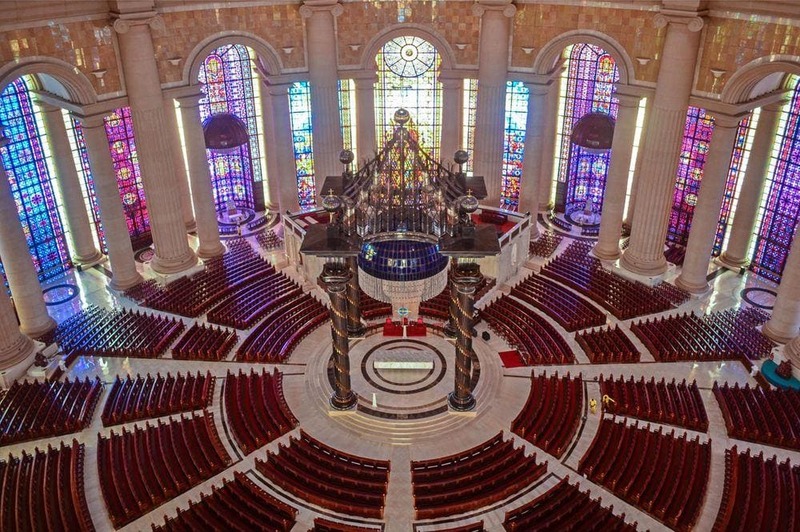 In the construction was used marble from Italy and 7,000 m² of stained glass from France. This huge amount of stained glass creates enchanting lighting inside the building. Houphouët-Boigny himself is depicted in one of windows as one of Magi kneeling before Jesus. Architect Fakhoury was not too shy either – his image is seen in one of windows as well. In spite of the eerily empty streets of Yamoussoukro and scarce numbers of worshippers (in contrast to the huge size of basilica) the building is maintained pretty well by Vatican and local people are proud of this building. It certainly is beautiful and helps to form positive image of Côte d’Ivoire. 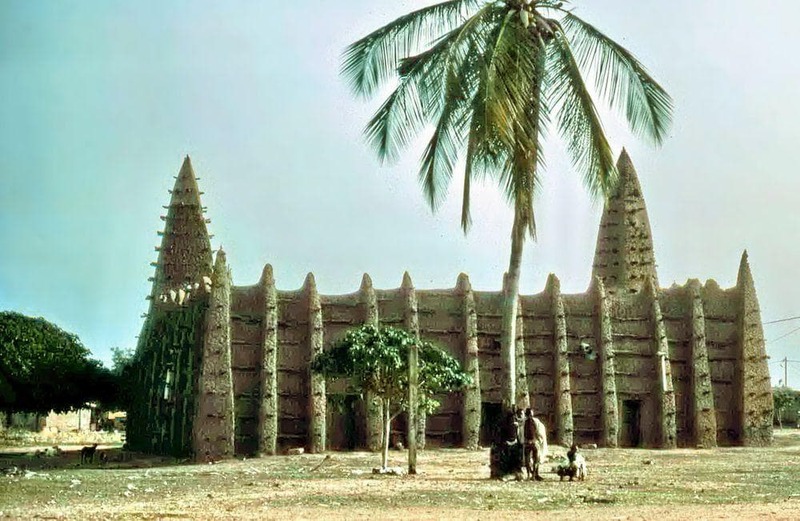 Among the most interesting attractions in this country should be mentioned several very interesting mosques in Sudano-Sahelian style, the largest church building in the world and the rich natural heritage. The late 1950s and early 1960s saw a large number of central and sub-Saharan African countries gaining independence, and one of the key ways in which they expressed their newly established national identity was through distinctive architecture. Parliament buildings, stadiums, universities, central banks, convention centers, and other major public buildings and housing projects were built in daring, even heroic designs—markers of the bright future these nations envisioned after independence. Two of the most ambitious religious edifices of the 20th century are the Our Lady of Peace Basilica in the West African country of the Ivory Coast and the Hassan II Mosque in Morocco. Nnamdi Elleh not only provides a substantial architectural and pictorial analysis of the buildings themselves. Using these two buildings as case studies, he also investigates questions of national memory, urban form, architectural styles, concepts of democracy, social hierarchies as well as the elites who make the decisions to build Africa’s post-independence monuments and capital cities.